‘Imagine a wraparound television with three-dimensional programs, including three-dimensional sound, and solid objects that you can pick up and manipulate, even feel with your fingers and hands. Imagine immersing yourself in an artificial world and actively exploring it, rather than peering in at it from a fixed perspective through a flat screen in a movie theater, on a television set, or on a computer display. Imagine that you are the creator as well as the consumer if your artificial experience, with the power to use gesture or word to remold the world that you see and hear and feel. That part is not fiction. The head-mounted displays (HDMs) and three-dimensional computer graphics, input/output devices, computer models that constitute a VR system make it possible, today, to immerse yourself in an artificial world and to reach in and reshape it (Rheingold, 1992 p.16)’. 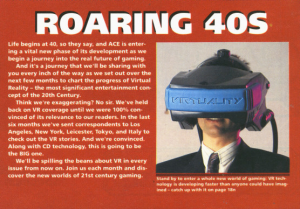 Although the first steps to virtual reality do not originate from the nineties, it was the period where it really took off for the consumer. Along with Rheingold book several attempts were made to bring virtual reality into consumer market. 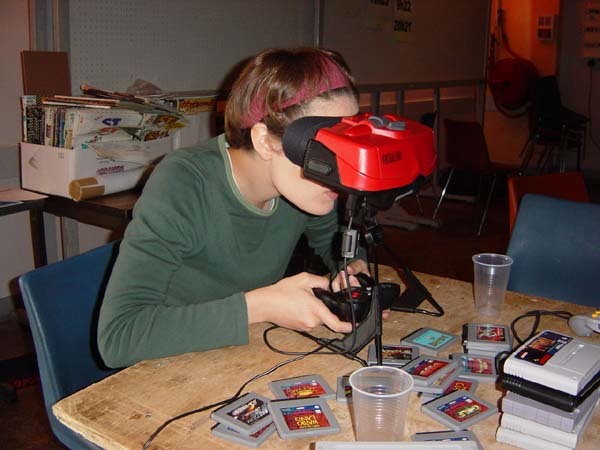 The best example is probably the flopped Nintendo Virtual Boy which was introduced in 1994 at a consumer friendly price of 180$. This is not something new, there were several attempts of marketing a low-cost set of HDMs. What is also not entirely new is that these devices featured stereoscopic 3D and motion tracking. So what exactly will be different this time around? Well, enter the Oculus Rift, a initially crowd funded, Kick Started project that surpassed its $25.000 goal with $2.4 million and an additional $16 million in investments. The Oculus Rift is the creation of Palmer Luckey, a VR and gaming enthusiast who once made a DIY guide for a HDM, by using your smart phone, plastic foam and some lenses. This idea let to the first prototype of the Oculus Rift which was born in a garage using a high-resolution LCD screen, lenses, a pair of ski goggles and… duct tape. Since then it has been backed by industry giants like Gabe Newell, Cliff Blezsinsky and even teamed up with John Carmack who worked on the very first titles of the undoubtedly popular first-person shooter genre. So far there have been thousands of so-called developer kits shipped to early financial backers/adapters since the project was funded in September 2012. As technology advanced, costs of small high-definition screens have been greatly reduced thanks to the success of the smart phone and as Luckey has demonstrated, even with some basic appliances you can make your own HDM. So far graphics have improved along with latency and more precise motion tracking, an essential feature for an immersive virtual experience. Luckey’s aim is to market the Oculus Rift for 300$, ultimately wishing it could be free. Gaming consoles can be sold below the actual fabrication price, creating revenue through the sales of games/software and additional hardware, in other words consoles can be subsidized. In this vein, the Rift could get a similar treatment, making it more accessible for consumers. One thing the Rift doesn’t lack is excitement from journalists and other people who’ve had a hands on experience. Just take a quick look at some reports and notice how, once again (remember the nineties?) the future has been seen and promised by those who were swept away by its seemingly magical spell. But let’s be very careful here since history has a nasty habit of repeating itself. So what has been shown so far? A few existing big titles like Doom 3, Team Fortress 2 and Dishonored have been ported and calibrated for the Rift motion tracking features but they are not native to the Rift. Smaller, indie developers have taken up the Rift and started experimenting leading to tech demos where you can ‘experience’ what is like to be on the guillotine, go on a virtual roller coaster or even perform surgery. There is no short supply of these avant garde like projects but how will these translate to mass market appeal? So far the Rift is compatible with PC’s, leaving out the entire console market. This partly has to do with the processing power the Rift needs to render a 3D space and the open programming structure needed for experimentation, something that is lacking in a closed system that consoles are. So far the Rift has not been announced to be compatible with the new generation of consoles like the PS4 and the Xbox One which will launch around this holiday season. If the Rift wants mainstream success it cannot be left solely in the PC gaming market unless somehow the PC segment starts dominating the game industry. Also consider that major game publishers aim at a large market, in other words they will not invest in a game that cannot reach a mass audience. For example, Electronic Arts has stated that they are willing to make games for the Nintendo Wii U , which only shipped 3.4 million units, if they sell more consoles. And even if a game sells in the millions, it can still fail sales expectations where games just break even. Big game publishers will be very cautious when it comes to new intellectual property and innovation. To be fair, the Oculus Rift development kits has only been in the wild for less than a year and it is way early to tell where VR developments will take us. We might even pose the wrong question here, maybe the we should not ask if the Rift will be a game-changer but how we will change the game. For consumers virtual reality might be a bad joke from the nineties, but it never left the realm of science, industry, the medical and the military. Therefore, for the time being at least, it might be more fruitful to look at the range of applications that are not necessarily directly associated with the foreseeable game climate. For example, it has been used as a medical tool, treating people with post traumatic stress syndrome, or learn amputees to use a prosthetic limb. If you place the Rift in the category of the avant garde and look how it is used in combination with all kinds of other devices you might catch a glimpse of a more virtuous and diverse reality. People have been experimenting with the Rift using it with a treadmill, motion controller, quadcopters, hand gesture controls, and even a holodeck-like experience. I have undoubtedly missed many more creative projects and applications but with these in mind, the possibilities might truly be virtually limitless. Rheingold, Howard. Virtual Reality: The Revolutionary Technology of Computer-Generated Artificial Worlds – and How It Promises to Transform Society. New York: Touchstone, 1992. « Snow Fall, the future of online journalism?